Ultimate luxury dream holidays on the beach in a tropical paradise. Nestled near Naples. Free high speed internet wi-fi access in every room. For rent by owner. Deluxe centrally air-conditioned two bedrooms, two full bathrooms, large living room, and full kitchen. Master bedroom suite with king-size bed and attached private bathroom/dressing area. Second bedroom with two twin beds. Living room with queen size sofa bed. All rooms open to 32 foot large private balcony overlooking the beach and sea. Full kitchen with all appliances, dishes, glasses, and cooking equipment. All rooms elegantly decorated and comfortably furnished. Three flat screen TVs (cable), DVD and stereo CD/cassette. Beach toys, beach chairs, and beach towels provided. Condominium provides everything. All you need is your personal stuff. Maximum occupancy is six. No pets. Only condo complex in Marco Island with both beach and boat docks. Huge heated swimming pool, tennis courts, and fitness center on site. 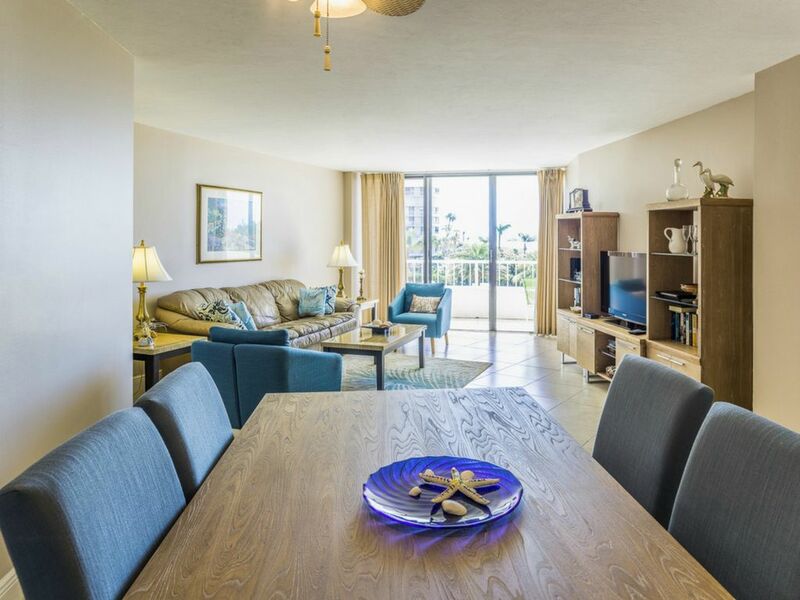 Located in secure, gated, beautifully landscaped, South Seas Club high-rise, beachfront towers. Warm Gulf waters with three miles of powdery, white, sandy beach and breathtaking sunsets. Enjoy poolside sunset socials and bridge games during winter. Nature lover's paradise. Watch dolphins play. Turtle nests. Gather sand dollars. Bird sanctuary on the beach with pelicans, ospreys, bald eagles, egrets, ibis, and herons. Boat rentals, jet skiing, parasailing, wind surfing, ultralight flights, beach volleyball, and guided nature walks. Fishing for mullets, snapper, crab, snook, and oysters. Many world-class golf clubs nearby. Play golf as owner's guest in owner's private country club. Dinner, casino, shelling and Key West cruise boats. Deep sea fishing charters. Outstanding American, European, seafood, and Latin restaurants. Dinner movie theatre, live theatre, and outdoor music programs. Everglades National Park, airboat tours, swamp buggy rides, alligator and wildlife parks. Ten Thousand Islands, Greyhound Dog Race Track, and Caribbean Zoo. Water ski shows, gator wrestling matches, and swamp buggy tours. Philharmonic and fashionable shopping in Naples. Many Florida attractions nearby. Sophisticated, cosmopolitan, quaint boutiques and specialty shops. Idyllic, small, tropical island atmosphere, ambiance, and experience. Perfect getaway for total relaxation and rejuvenation. Within driving distance from many major airports. GREAT FOR FAMILY, FAMILIES !!!!!!!! We are a professional couple, now retired, who enjoy living beachfront life in our beautiful Marco Island. We have been here full time since 1996, and are still amazed at the beauty of this island. After tiring of cold Michigan winters, my wife and I decided to move to beachfront living in Marco Island, one of the cleanest and upscale island resorts in Florida. When kids got married and started bringing babies to visit, we had to move to a 3 bedroom beachfront condo. But we still loved our 2 bedroom 2 bathroom beachfront condo. So instead of selling it, we started doing vacation rentals. We enjoy meeting with people from all around America and the world who rent our condo. Some of our guests develop into our friends and they go out golfing with us in our private country club. My wife and I love carefree beachfront living. Marco Island is like heaven on the earth. Golden sunshine, warm waters, white powdery beach, clean air and outstanding climate. We have some of the best restaurants in the world. Marco Island offers a small beach town ambiance. Best of all, it is full of happy and friendly people to socialize and play golf, tennis, bridge and other games. Full bathrooms with bathtub, shower, toilet, cabinets, mirror, etc. Luxury upscale new looking resort. Golf in our private club as our guest. Full kitchen with all appliances, dishes, glasses and utensils. Beutifully decorated and furnished. All dishes, glasses and cutlery provided. Right on the Beach, All rooms open to a private balcony overlooking the sea and the beach, Three Cable TVs, Free wireless high speed internet access, Dishes, Glasses, Silverware, Stove, Full Oven, Toaster Oven, Coffee maker, Blender, Juicer, Cooking Utensils, Linens, Beach Chairs, Beach Toys, Beach Towels, Tennis Courts, Boat Docks, Boat Cruises GREAT FOR FAMILY, FAMILIES !!!!!!!! When we asked the owner if there would be enough room for my husband and our 5 kids, he said yes. I booked this 6 months in advance, plenty of time to find another rental if needed. When we arrived there was only a king, and two twins. The couch pull out was falling apart. We had to spend $$ to get air mattresses and linens.. did I mention there were no linens or soap, paper towels, 1 roll of tp. When we called the owner it went to voicemail and he never returned our call. Our listing on VRBO clearly states that our condo has 1 king bed in the master bedroom, 2 twin beds in the second bedroom and queen sofa sleeper in the living room. None of the previous renters with children mentioned that the queen sofa bed was not working. Our condo provides starting supply of sundries. Our renters are clearly requested to replenish when needed. Loved the location of this condo! We took our 18 year old son to Marco Island for his senior trip. I had made the reservation months ahead of time since it was during Spring Break week. We were notified a week before we left, by the condo owner, that the windows in this condo were being replaced due to hurricane damage. The owner of the condo said he had just found out that this was being done, and that the windows in our room would not be replaced while we were there. After our arrival, we talked to the front desk office and the lady there told us the condo owners were notified 6 months prior that the windows were going to be replaced and when. She even told us this was considered an active construction zone. Some days the noise was very loud, even the front desk lady was complaining. So with that being said, the condo itself was very nice, clean, and comfortable. We loved the location which is close to Tigertail Beach and would stay in this building again. It would have been nice to know at the time I made the reservations that this was going to be an active construction zone during the time of our vacation. Total deception. The photos do not show the real view we had. This condo is on the 2nd floor contrary to what we saw on the pictures no 12. The view (balcony) is in front of a parking lot and just above/beside the main landing stage. Not quiet because of the come and go of the residents, car, deliveries. Air conditioning very noisy because the unit is in wardrobe in the condo itself. Nothing is luxurious there, contrary to the owner's description, wine glasses, dishes, very cheap. Dishwasher not working well, coffee machine the same (leaking). The equipment for the beach is poor. No umbrella, except a small one to attach to a chair, which was broken. Camping chairs, not confortable for beach at all. We were also deceived by the state of cleanliness. Dust under the bed, in a corner of the living room there was full of dead bugs. Ceiling fan dusty. Our bed sheets were full of pilling and make them inconfortable. We never saw the 3rd tv as mentioned. Most of all, there was construction in this tower (change of window and door). The owner knew that for quite a long time but never mentioned that to us. Misrepresentation from his part. He finally agreed for a very small credit. It was the worst month of vacation of our life. This construction will last for a long time be aware of that. I have pictures and video of all the above mentioned and ready to forward them to you before you rent this place. We are obviously disappointed with this review. All our past reviews have been very positive. The guest was obviously unhappy with the noise of some neighboring condos replacing their windows. We tried to work with him to make his stay as pleasant as possible. We gave him over $1000 discount to compensate for the noise. We also gave him access to a private golf club on the island so that when it gets noisy, he could enjoy time in the club. We had air conditioning service come to quiet the air conditioning. Our condo is managed by a professional company which uses a professional cleaning service. We had a great trip to Marco and it all started with a hassle free rental process. Dealing with Ashok was easy and he made everything very accommodating. The two bedroom condo was very clean and well stock for vacation needs. The beach view from the balcony was just fine and hearing the birds in this quiet community faded everyday noise to a distant memory. We enjoyed may local eateries including Quinn's at the Marriott, CJ's on the Bay, Konrad's, Snook's, Rookies and the Sunset Grill. This was lay low vacation and with temperatures in the 80's it was just perfect. We ventured to Tigertail beach for our last two days and took advantage to the access for chairs, tents and a full service grill on the beach that had food and beer...this was very convenient. Would recommend this spot for anyone seeking a tranquil piece of heaven. PS - Signing of the shells show just how much this condo is liked ...nice touch !! The condo was nicer than expected .Loved the layout with the bedrooms down the hall rather than right off the living room. Very very clean which was wonderful after a bad experience last year in a different complex. The views were great . We wanted to rent again next year but the unit was already rented for our time slots. Thank you for a great relaxing vacation! Golf in a private club as our guest. Poolside sunset socials and bridge games during winter. bocce ball, tennis, fitness center, boating, shuffleboard, pickleball, etc.